Every now and then, I love having meatless light meal. 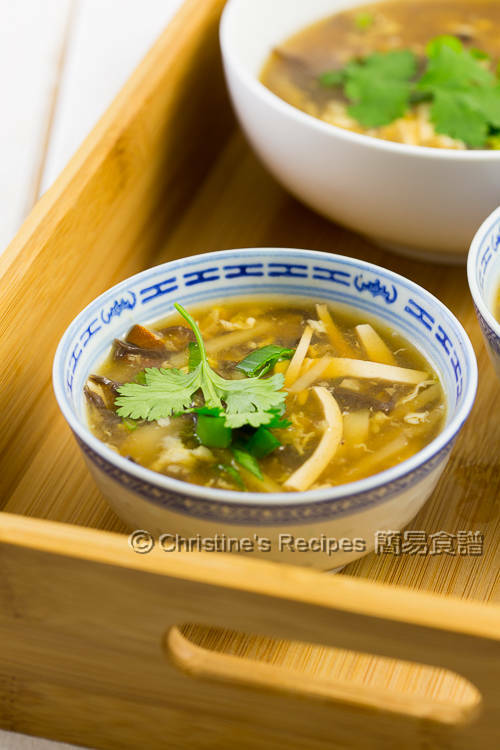 This vegetarian hot and sour soup is my favourite one. 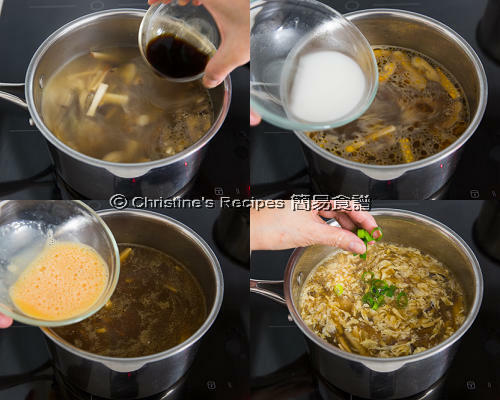 The original hot and sour soup that we used to have will need a small amount of shredded pork or chicken. This meatless version needs something to add flavours for sure. Thus the vegetable broth base is the most important part. Both shiitake mushrooms and spicy tofu are good ingredients to add umami taking this soup dish up a notch. My family and I are not vegetarians. Sometimes I’d use chicken stock for convenience as I always have some in my fridge. It’s good to have meatless dish for cleansing our body. Take this tomato egg drop soup as an example. It’s very nourishing and comforting. 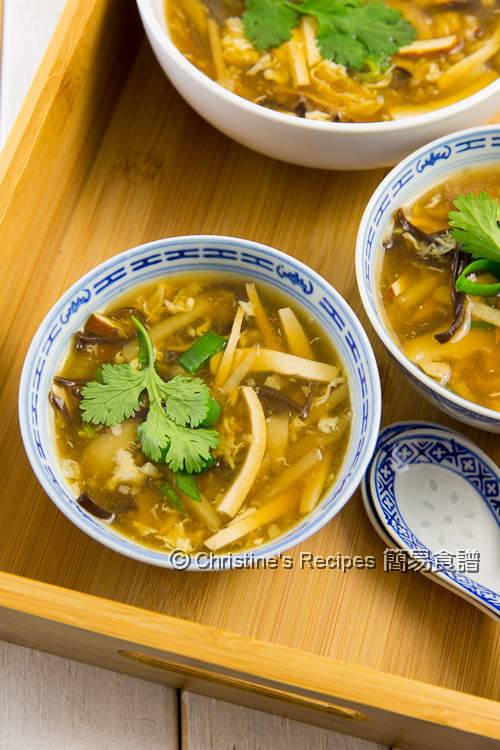 Back to this vegetarian hot and sour soup recipe, it is quite forgiving. If your family doesn’t eat anything yielded in the recipe, say garlic, you can simply skip it. 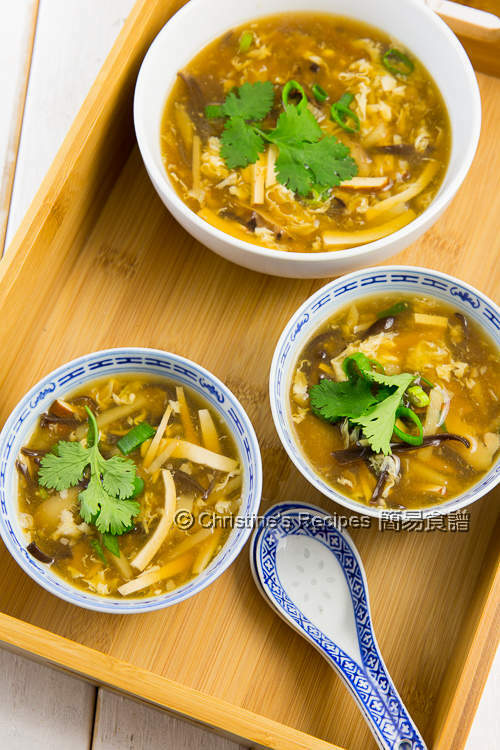 Tofu, egg and wood ear in this soup, are very common ingredients for Chinese cooking, All these things have high protein, low-calorie and high dietary fiber contents. The sour and spicy broth base is the soul. It’s all about balance and personal preference. You may adjust the amount of black vinegar and chilli oil to your liking. 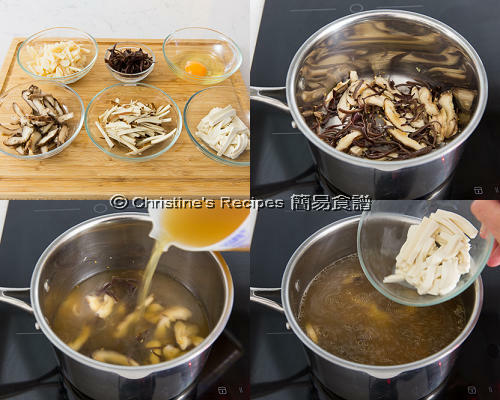 Many people like adding bamboo shoots in this soup. I don’t eat it though. You might like to add it back. There’s no right or wrong in choosing ingredients. The most important thing is to get the soup balanced in taste and in texture. Trim the hard end of wood ear. Julienne wood ear, shiitake mushroom, spicy tofu, firm tofu and water chestnut. Set aside. Heat oil in a large pot over medium low heat. Saute garlic until aromatic. Be sure not to burn it though. Or else your soup will taste bitter. Add wood ear and shiitake mushroom. Stir and cook until fragrant. Pour in the vegetable stock. Increase heat to high and bring it to a boil. Add spicy tofu, firm tofu and water chestnut. To prepare the thickening, thoroughly combine the potato starch and water. When the soup boils again, pour in the sauce ingredients. Stir in the thickening. The soup will turn thicker. Turn off the heat. Steadily pour in the whisked egg and gently stir around with chopsticks, a large spoon or a fork. The egg should immediately turn into ribbons. Sprinkle diced spring onion and white pepper. Garnish with coriander. Serve immediately. For convenience, you can use store-bought vegetable stock. Or use chicken stock instead if you’re not a vegan. 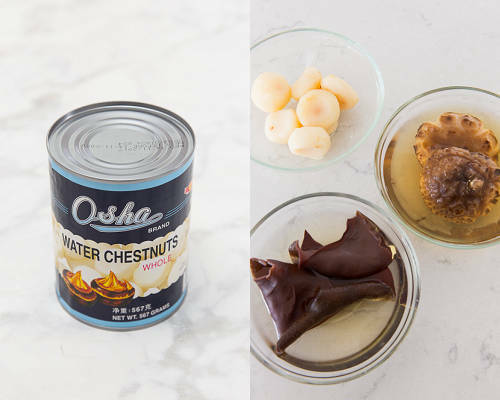 Canned water chestnuts are already peeled, very handy, available at Asian grocers. The amount of black vinegar and chilli oil can be adjusted according to personal preference. Would be really nice with some steamed buns for a really satisfying and delicious meal. However, in your intro you state that eggs and tofu contain "high dietary fiber content". Eggs and contain no fiber at all. You're right eggs and tofu don't contain much fiber. What I said the "high dietary fiber content" is referring to wood ear in the post. 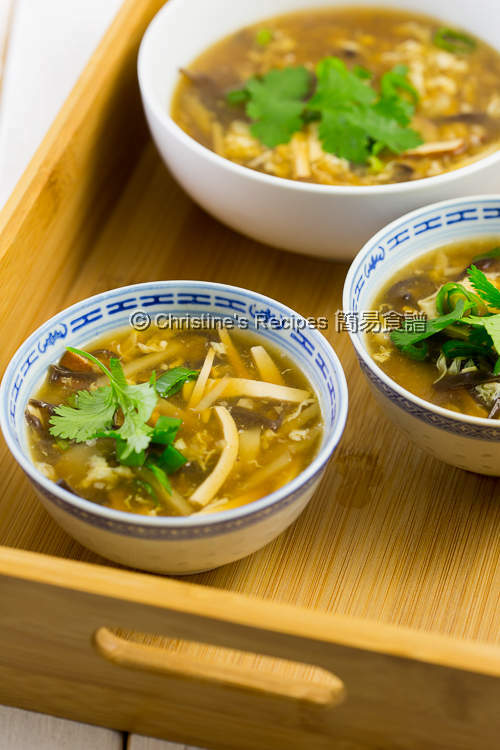 "Tofu, egg and wood ear in this soup, are very common ingredients for Chinese cooking, All these things have high protein, low-calorie and high dietary fiber contents."